For those unfamiliar with ethereum, it’s a cryptocurrency platform that can be used to do a number of things. But over the past year, it’s been used to create hundreds of other cryptocurrencies. You may have heard them referred to as “altcoins.” And the term for them launching their new cryptocurrency is “ICO,” or initial coin offering. When they do this, they sell their coins on the open market and get ethereum in return. As a result, a lot of the world’s ethereum was held by the creators of these altcoins, making it scarce and driving the price up. But during the mania of last fall/winter, many new coins were exposed as frauds. Since then, regulation has picked up, but there’s still a level of fear that has scared a lot of investors out of ethereum. 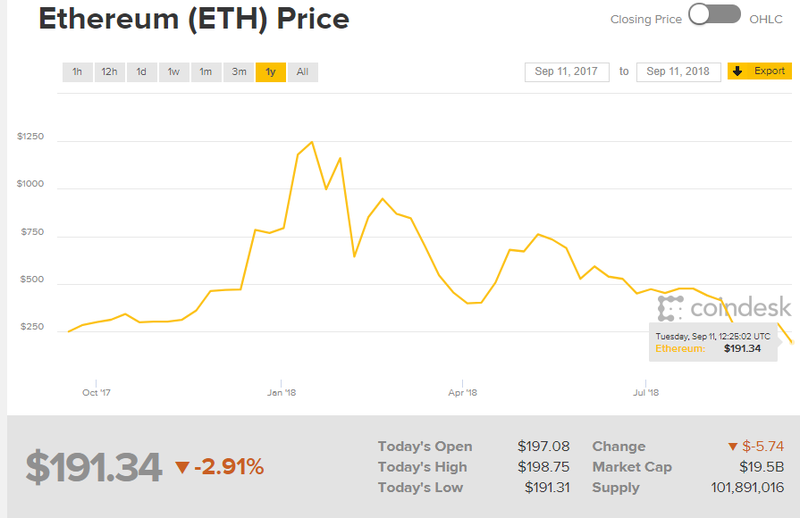 The one-year return of ethereum is now negative. That’s never happened before. Not even back in December 2016, when it was trading at a 10-month low of $6.94. Even at that point, it was up almost 700% from a year prior. Even the coins that are legitimate have played a part in ethereum’s dive. The survivors have now fallen so much in price that they need external funding. To stay alive, they’ve been selling all of the ethereum that they got during their ICO. This has been a deadly combination of events. More sellers need money now, and there aren’t nearly as many buyers. The end result is that millions of ethereum have been dumped into the marketplace, with fewer people willing to buy it, and as a result the price has tanked. So if you’re looking for a deal in the crypto world, ethereum is hard to pass up. But be mindful of the fact that it still hasn’t found a bottom. And until suffering altcoins stop selling and buyers return to the marketplace, it will continue to fall. Like any investment, buying ethereum over time is the smartest approach. Instead of putting all your money at once into something that will most likely go down in price, put smaller amounts in over whichever time horizon that you choose. That way, if it keeps falling, you won’t be stuck at one price entry. Editor’s Note: I, along with a few esteemed colleagues, publish our insight in our e-letters called Sovereign Investor Daily and Winning Investor Daily. Every day, we send you our very best ideas to help protect and grow your wealth. Sign up below for free.